I thought I'd write a small post about my houseplants and the winter colour in our conservatory. It's traditional to bring in a sign of Spring into the house on St. Brigid's Day (1st Feb). I had just bought a new orchid - but sadly managed to break off one of the flower stems when I was unpacking the plant. Luckily they make great cut flowers and are still going strong after over a week. I bought four amaryllis from Marks and Spencers this year- so far three of them have flowered -- two different types of red and a pink! My first ever bromeliad - hopefully I will be able to keep it alive! The yellow one is a new one this year - I always try to keep an eye out for orchids (and other houseplants) in the reduced section in Tesco or Marks and Spencer. Out of curiosity I've decided to keep all the labels from whatever wool I work with each month - the above was the month of January! I think it's quite impressive really - it was one hat, one shower puff and 9 pairs of wrist warmers. February is proving to be a slower month so far as I am using sock yarn and a 3mm hook and it is much much slower to work with, but I guess it will average out over the whole year. One rainy day last month I decided to do my big sort through all my yarns - so the above photo is just about everything that I own! I cleared out a big bagful of stuff that I wasn't ever going to use and will pass it on to a fellow crafter for their projects. Embarrassingly, I found several lovely yarns that I'd totally forgotten ever having bought!! For quite a while now I've been quite firm on my 'yarn ban' -- I try to only buy yarns for custom orders (or if I'm on holiday!!) so I don't have quite AS much as I used to but it's still an awful lot. Apologies for not keeping this updated yet again - Peter was terribly sick with vertigo and that kind of took over for a while. Fortunately he is 100% again but it was a hard week or so. As you can hopefully see, I'm keeping busy - I want to try and get my Etsy shop running properly again; I only have less than 15 listings there at the moment and need to get proper photos taken of the other wrist warmers that I have, and to get them listed too. Well, it's the middle of January already and the last time I posted in here was way back in August. A LOT has happened - we lost four cats last year and it's hit me SO hard. James and Bertie to kidney failure, Oscar to lymphoma and we had little Bear with us for just a few months before she was killed on the road. It was an incredibly tough year; Oscar and Bears' deaths hit me especially hard and to be honest I've really struggled with my depression in the last few months. We've decided not to take in any more cats - unless they turn up in our garden - as it just hurts so much when we lose them. Maybe in the future we will foster kittens/cats for Klaws (our local animal rescue centre) but right now we have Pearl, Dinah and Ivy and hopefully they will be with us for a long time. I just haven't really been coping too well with all the loss so I've let my Etsy shop slide - I'm still crocheting away (it can feel sometimes like the only thing that keeps me sane sometimes) - I just haven't been photographing and listing it online. My Christmas markets were quite successful - which is great as I'd nothing going on Etsy last winter; I went to three -- Caherdaniel, then Cahirciveen and Waterville was last. Waterville has always been my best one - it wasn't this time round but I think it's probably because it was my last one and I didn't have SO much to choose from. The most important thing was that I was able to raise the funds to continue the sponsorship of my two girls through ActionAid Ireland. Airmid soaps asked me to make more of the soap savers and scrubbies for them towards the end of the year (this also helped boost my sponsorship funds) --- you can buy them here … https://airmidsoap.com/collections/accessories they've been so great to work with - I'm really proud to be one of their suppliers. Anyway, this is this year's colour - a lovely cornflower blue with tweedy dark and light blue flecks running through it. I've only just finished the hats/wrist warmers last week, I really did lose my motivation after Oscar died; but Barbara doesn't need the items until the 12th August so it all worked out ok. I didn't take a photo of the finished hats - I'll make another one from the leftover wool though so I must remember to take a photo of that one instead. Wow, well it's been almost two whole months since I last posted an update on here...Oscar's death has hit us both really hard. With a small bit of hindsight now I can say that I'm so glad that he didn't have a long, lingering illness and we're especially glad that he was able to die peacefully at home (without that final trip up to the vets at the Ark) but at the same time I wish so much that he could have had a longer life before it was his time to go. I am keeping going with my crochet - I did lose a lot of my motivation to keep going after Oscar's death but it really does help me to cope with things...it relaxes me greatly and is my favourite way to unwind. I've made several of these ~~~ pure cotton shower puffs! They're relaxing to make as it's the same stitch over and over and over again, so they're something pretty simple for me to make. 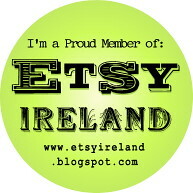 Last month I was able to go to the market in Portmagee a couple of times and I sold one of them! The market was a bit hit or miss, as they usually are --- I only had two customers both times, but luckily both times one customer bought quite a bit. My friend Kate has offered to sell my wristwarmers along with her amazing knitted hats and jewellery pieces at the markets when I can't be there - so far she's sold four pairs! She goes to the market in Millstreet as well as the one in Portmagee. Earlier this Summer Lucy (from Sea Synergy) asked me to make a few beanie hats for her centre - she provided the wool for me (just acrylic made by Robin but it's quite good quality). I finally got around to starting on them last week. The hats are in three different shades of blue (the colours of her logo); the wool is dk so I'm using all three colours at the same time and an 8mm hook to give a chunky beanie hat. I really like the effect this gives. For the first time in AGES I brought my crochet down to the beach on my last couple of days off; it was so good, I need to do this more often when I can. Oscar died soon after I'd posted my last update on here...over a couple of weeks he'd started to deteriorate slowly, eating less and less and sleeping more and more. We wanted to keep him at home for as long as we could and were hoping that we wouldn't have to take him to the vets to have him put to sleep; so we kept in close contact with our vet in Killarney and had doubled his dose of steroids. We are so relieved that we didn't have to take him up to the vets and that he was able to pass peacefully at home in familiar surroundings. He'd spent SO much time in the vets in the last few months, including overnight stays in intensive care, being on drips etc so it was a comfort to know that we didn't have to take him there again. The house feels very empty without him; as a kitten he had really bonded with me and over time developed that same deep relationship with Peter too. He was a really special one and I know we won't ever forget him. I still remember Peter coming home with this little whisp of a kitten and how we struggled to get him to eat and to put weight on (it turned out that he had colitis so that's why he hadn't thrived at first). https://selkiecrochet.blogspot.com/2012/01/another-cat-related-post.html this was my post about him at first. I had been devastated by losing Mr Evie - a stray cat who had died at the vets and Peter brought home this little foundling to help me through it. He really was so precious to us both, I can't quite believe that he's gone and that we'll never see him again; I will remember him as he used to be, a chirpy bouncy tigger of a cat rather than the pale shadow of himself at the end. I don't want this to be a depressing post so here are the latest updates on my two sponsor children - Bariki in Kenya and Si in Vietnam. I just LOVE the helicopter that Bariki drew for me! I hope so much that she can reach her dream of becoming a teacher and that she holds onto that dream. I received a new photo of Si recently - she's grown up so much since the last photo they sent me; I can't remember how often they send out photos, maybe once a year or less? With every update you get a drawing from the child themselves and then a written update from the field worker with the local community. I need to send them both some more postcards! The sponsorships are done through ActionAid Ireland if anyone reading this is interested (??) - mine are both paid for thanks to my sales on Etsy and through craft markets.